Hello everyone, this weekend its time for our Flange Pillow class. For the list of materials see here. 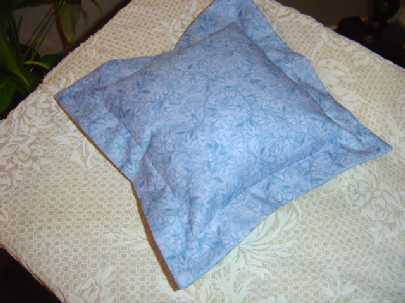 There are two parts to making a flange pillow, firstly, finishing the stitched piece and then making the pillow. Lets begin by getting the stitched piece ready. Press your stitched piece from the back. Measure out 1 inch from the stitched edge and trim. Cut some light coloured backing fabric (I used calico fabric) to match the same size as the stitched piece. 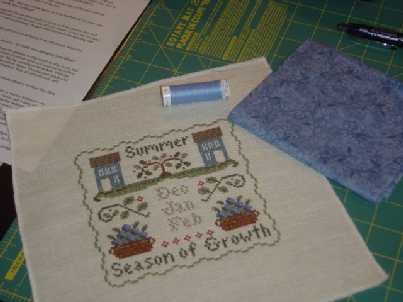 Place atop of stitched piece, right sides together. Sew together using a 1/4 inch seam, leaving a small opening for turning. Trim if you need to and turn right side out. Press and blind stitch the opening closed. Now for the Pillow: these next instructions are based on finishing a 9 1/2 inch square pillow, with the flange measuring 1 inch. Cut two 9 3/4 inch squares from your coloured fabric. Now pin the two pieces right side together. 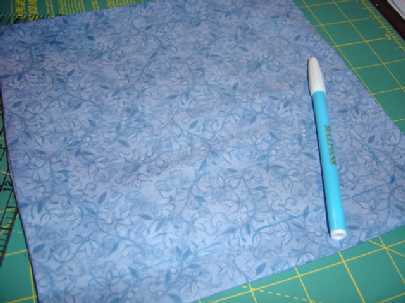 Sew all around using 1/4″ seam, leaving a small opening for turning. Turn in right way and press. Mark 1″ from the edge all around the square on wrong side of pillow -this is where you will sew to make the flange. I use a water soluble pen to do this. Start your sewing parrallel to the outside opening and sew around the square, finishing parrallel to the other end of outside opening. 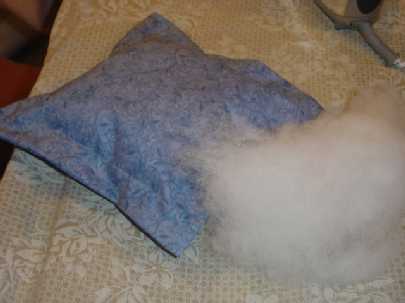 Now you are ready to fill your pillow with stuffing. 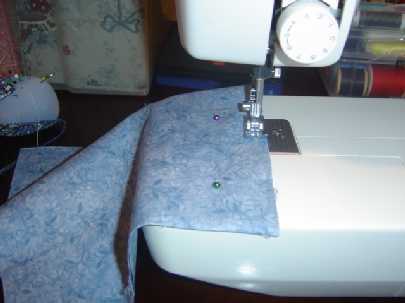 Fill to desired “puffiness” and then you can either handsew the two openings closed or use your sewing machine. I sew the inside opening closed and then use a blind seam on outside edge. 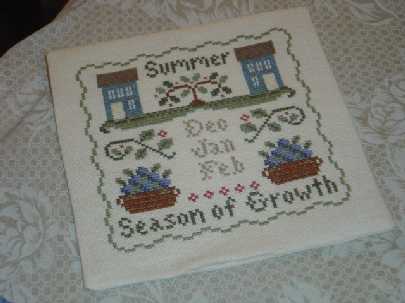 Now its time to join on the stitched piece. 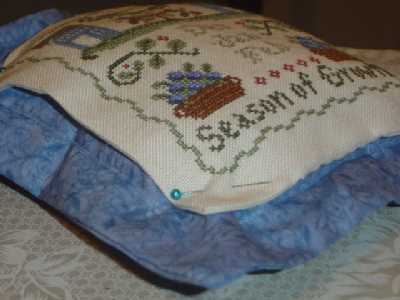 Place stitched piece onto pillow and pin into place. You can use buttons that have been covered in matching fabric, like I did, or other suitable buttons. 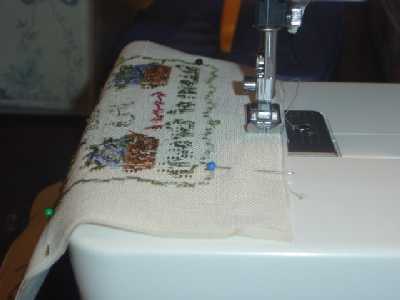 Sew buttons onto four corners, sewing through the stitched piece to the pillow to secure. That’s all there is to it – admire your pillow!! I hope these instructions make sense -like I said earlier, please feel free to ask any questions if you have any. I know that some people will use a different sized stitched piece so the measurements will need to be adjusted to allow for that. If you need some help with working out what size your pillow will be, please let me know. 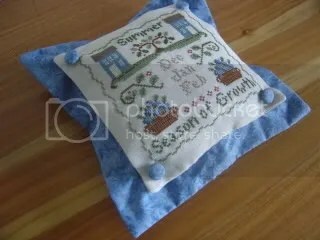 Also, please post a photo to the blog of your finished pillow as everyone would enjoy seeing them. This entry was posted in Classes, Pillows, Tutorials. Bookmark the permalink. Wonderful tutorial Katrina! Very detailed and clear explainations. Thank you. Great tutorial Katrina – thank you! Hi Katrina: I’m just gathering my supplies together to give this pillow a try and I’m wondering what kind of buttons I need to buy if I want to cover them in fabric? I have never covered buttons with fabric before. Do you glue the fabric to the button? It included instructions on how to cover the buttons and a little gizmo that did it for you. Anne, I’m not Katrina (:)) but you can buy buttons that you cover from Joann’s, like these ones: http://www.joann.com/joann/catalog.jsp?CATID=cat3677&PRODID=prd50054&source=search. Of course, I’m assuming you’re in the US? Thank you for the great tutorial. Incredibly helpful! Thanks for giving advice on how to make these pillows. Fastening the corners with cloth-covered buttons may give it the ability to change the tops based on the holiday or season. Good tips.